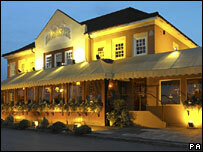 Pubs group Mitchells & Butlers (M&B) is to snap up a slice of Whitbread's pub restaurants estate in a £497m deal. The All Bar One chain owner has agreed to buy 239 freestanding Beefeater and Brewers Fayre sites from Whitbread. M&B plans to convert the sites to its own formats, including the Harvester brand, over the next two years. The deal should boost future earnings as the sites are in residential areas, with over half in the "high growth" South East and South West, M&B said. "With this transaction, we have secured 239 of the best pub restaurant sites in the UK; as defined by their locations, their scale, and above all their sales and profits potential," M&B chief Tim Clarke said. The sale is part of Whitbread's strategy to concentrate on pub restaurants sited close to its Premier Travel Inn budget hotels. Whitbread already has 271 Beefeater and Brewers Fayre sites located next to the hotels, a combination it says has led to "some of the highest returns in the industry". Whitbread also operates the Costa Coffee, TGI Friday's, Pizza Hut and David Lloyd Leisure brands.